When it comes to the best online strategy games, we look for different elements: gameplay, graphics, strategies, units and other in-game possibilities. In this list, you’ll find TOP 5 online strategy games that are free to play on your browser. Let’s take a closer look at each game. Thrones – regulary updated online strategy game, which has more than 2 million players right now. In the beginning of the game you start with a small and unwealthy kingdom, you help your citizens with creating both administrative and resource structures. Like in every other strategy game, these resource buildings allow the standard collection of food, lumber, iron, and stone as your administrative buildings allow you improve resource gains, skills, train units, modify equipment or engage in a wide range of other base-supporting activities. The key factor of learning how to play Throne: Kingdom at War is following quest tracker which will appear at left sidebar of your game screen. This will also help you to level up faster on the game. If you have played an online strategy game before which is based on resources, we believe that you should also know that resources are the key factor for getting stronger in the game. You need to take care of your resources buildings and you need to keep upgrade them. This will help you to gain more resources and more resources means more building upgrades and more warrior units. Since the game is quite new, you can get stronger in the game if you can take care of your account. Vikings War of Clans is a nice medieval strategy MMO game that you can play free. The game has many online players from different countries around the world. You can create your clan and kingdom in the game. You can fight against other viking clans and you can destroy their buildings. The game has outstanding graphics. The game offers the traditional, addictive kingdom-building gameplay that we’ve learnt to appreciate in many games of the same genre, on top of an in-depth progression system and an interesting hero system to provide some much-appreciated variety and additional complexity. The game also features truly excellent 3D animations that give Vikings: War of Clans terrific scores for graphics and presentation. Our town is alive, and you can see the townsfolk bustling around your buildings, working the forges, mines and farms. Overall, Vikings: War of Clans is a great browser strategy game that does provide a top-notch and addictive war game experience to all those looking for an old-school, traditional gameplay. 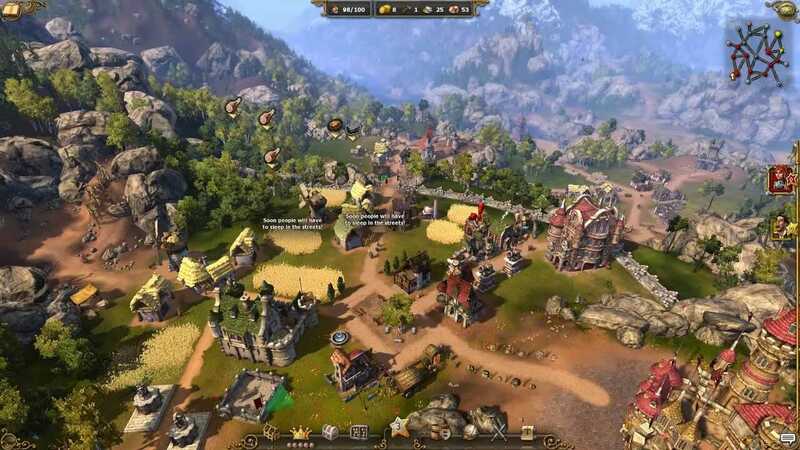 While Travian isn’t a perfect game it is a staple title that offers hours of addictive fun to players seeking a strategic browser-based masterpiece. Rail Nation is a browser-based 2D strategy MMO where players manage railroads. Players begin by picking a faction: the Western Pacific Railroad or the Eastern Atlantic Railway unions. Choose a hub city for your main train station. The train station houses multiple buildings that benefit a player’s railroad operations, including an engine shed, lottery building, and laboratory. Buildings can be upgraded to further bolster their reach on the country’s rail system. Players can pick from multiple trains to pick up and deliver goods for profit, with more trains unlocked as eras go by. Eras advance as server time passes regardless of whether or not you are actively playing, meaning you can come back to Rail Nation in a month to find that the game has progressed to the third era, unlocking new trains and goods to use. Overall, the game requires strategy and analysis before it rewards you with satisfactory results. Rail Nation begins like any other browser game, with you choosing an avatar before heading into the tutorial, which is fairly long but detailed and easy to follow. Even here, Rail Nation’s relatively sophisticated approach to difficulty becomes apparent. While it isn’t actually a difficult game, it’s a welcome change from MMOs that virtually throw level-ups at players in order to create a false sense of accomplishment (and keep them playing). The main portion of the game takes place on your city map. As you make your way through different ages more buildings and decorations will become available, as well as an expanded building area. Players will have to spend their coins and supplies to create new buildings and choose a spot to place it. Buildings can also grow in size as time passes, reflecting the new standards and needs of more civilized ages. You’ll need to carefully plan out where you want your buildings if you want to ensure you have enough space for future buildings when you need them. Another primary focus of the game is army management. Successful civilizations will need to expand, which can be done through trade or by force via combat. The five different types of units that can be used are: light units, ranged units, fast units, heavy units, and artillery units. Knowing what units to mix and match for different situations is key to winning battles. Battles themselves are fought in such a way that the defender is played by AI with predetermined troops. If you can manage to defeat the defender you will take over the sector they are guarding. You can only own a province once you take over all of its sectors.